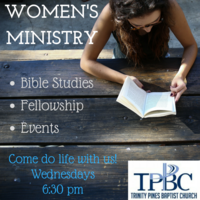 Trinity Pines Baptist Church Women’s Ministry hosts various activities throughout the year. Bible studies are led throughout the year by various facilitators. If God is calling you to serve women, then we invite you to find your place as we seek to equip, encourage and embrace women of all ages, from all walks of life, in becoming women who glorify the Lord. Women’s Ministry Bible studies meet on Wednesday evenings at 6:30 pm in the classroom next to the chapel.